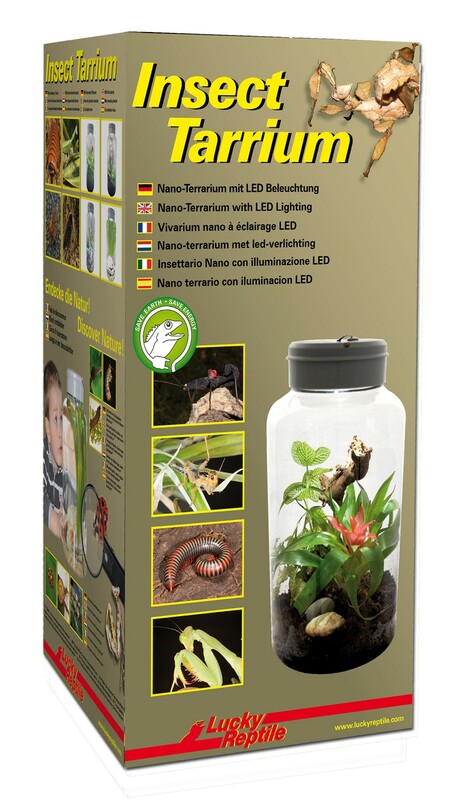 Lucky Reptile InsectTarrium 5 Litre | Livefood UK Ltd.
Our Insect Tarrium is ideal for explorers and those who want to be one. It can house mantids, stick insects, beetles, spiders and many other small invertebrates and even aquatic species. For most animals like insects and snails that children find outside on their excursions the InsectTarrium is the perfect container to watch them for a while before releasing them again into the wild. And for adults the attractive cylinder shaped tank with its LED lighting offers diversion on the desk. The InsectTarrium is made of robust PET plastic. The removable LED lid contains a fine ventilation mesh, feeding door and an LED light unit with two daylight and one moonlight LED. A light sensor automatically switches over to moonlight when it is getting dark.